Liver cirrhosis is the end stage of different chronic liver diseases. The prevalence of liver cirrhosis is growing due to the increasing burden of risk factors that include Hepatitis B virus (HBV) and hepatitis C virus (HCV) and liver cancer. Globally, 257 million people were infected with chronic HBV in 2015. Asia and Africa were the two continents with high endemic, an overall prevalence of over 8%. Liver cancer is the 7th most common type of cancer according to Glococan 2018. Around 841,080 people are diagnosed with liver cancer ever year globally. 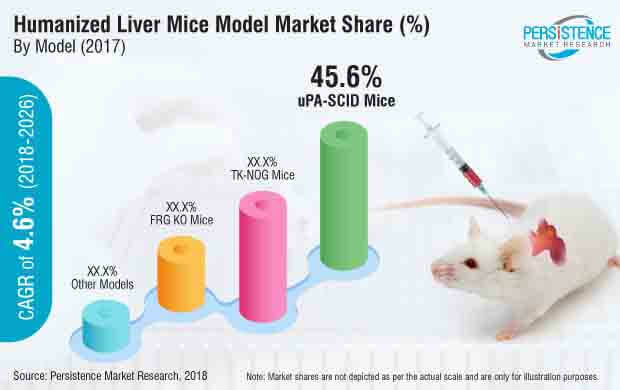 With the increase in prevalence of liver cirrhosis globally the number of studies based on treatment for such conditions is also increasing, which is expected to drive the growth of the humanized liver mice model market. A number of research studies are focused on developing new humanized liver mice models. Initially liver mice models were developed by using simple immunedeficient mice implanted with human liver cells or hepatic cancer cells. However, the results were not consistent and not reliable. This led to the development of immunedeficient mice that naturally destroy the mice liver allowing the human liver cells to grow and replace to form stable humanized liver mice models. For instance, a number of research-based studies are exploring the use of PPARalfa and AFC8-based mice models for the development of humanized liver mice model. Another humanized liver mice model known as the hPXR/CAR/CYP3A4/ 2D6/2C9 mouse has 33 mouse genes replaced with human genetic counterparts. Furthermore, with advancement in genetic technology there is a better scope of developing new genetically engineered humanized liver mice models. One such example is the CRISPR technology. The increasing number of drug approvals indirectly indicates the volume of research and toxicity studies including pre-clinical studies with disease animal models including humanized liver mice model. Although there are not many liver disease-associated drugs approved by the FDA in the past few years, the frequency of drug approvals is increasing. For instance, only 4 drugs were approved from 2011 to 2014 for hepatitis treatment. However, within the span of 3 years (2015–2017) there were about 8 approvals for the same. The cost of humanized liver mice is significantly high. The high cost of the humanized liver mice model is expected to hinder the growth of the humanized liver mice model market. For instance, the immunedeficient mice used for liver studies through grafting are available in the range of US$ 140–500, whereas chimeric humanized liver mice with 75–90% of human hepatocyte replacement, cost about US$ 2500–3500. Furthermore, there is generally an added cost of shipping that can vary based on the distance. With the requirement of specialized shipping containers and shipping protocols, the overall cost of shipping adds to the cost of the mice itself resulting in an expensive humanized liver mice model. Animal studies follow a principle called the ‘3Rs’ – replace, reduce and refine. 3Rs is a policy that provides a framework for humane research. Replacement of animal models allows use of alternatives such as 2D & 3D cell lines or lab-on-chip devices such as the liver on chip device. It is recommended to reduce the number of animals used for experiment through careful consideration of statically methods and experiment protocol. With the introduction of the 3Rs there is a pressure on the use of animal models in experiments so as to minimize animal suffering without compromising on the statistics of the experiment or research. This section of the report profiles of key players operating in the humanized liver mice model market based on their differential strategies, product offerings marketing approaches, and company dashboard. Examples of some of the key players featured in the report include Yecuris Corporation, PhoenixBio Group, Beijing Vitalstar Biotechnology Co. Ltd., Hera BioLabs, Taconic Biosciences, Inc., University of Massachusetts Medical School, Oncodesign, University of Nebraska Medical Center and Jackson Laboratory. Humanized mice models are mice that carry functioning human genes, cells, tissue, and/or organs. There are many ways to achieve humanized mice models through gene editing and replacement of mice liver cells with human liver cells. Most of the companies offer humanized liver mice with the replaced human liver cells or may have models that require grafting by the buyer. These humanized liver mice models include uPA-SCID Mice, FRG KO Mice, TK-NOG Mice and others. The uPA-SCID, FRG KO and TK-NOG mice represent high chimerism with 70–90% of mice liver cells replaced with human liver cells. PMR conducted a research on humanized liver mice model market for the forecast period of 2018 to 2026. The report offers a comprehensive evaluation of the business opportunities prevailing in the humanized liver mice model market along with insights on the consumption trend, disease incidence, and humanized liver mice model market competition. The report elaborates the macroeconomic factors influencing the dynamics of humanized liver mice model market and its futuristic potential. The report offers a comprehensive taxonomy of humanized liver mice model market based on model, application, end user and region. The types of models include uPA-SCID Mice, FRG-KO Mice, TK-NOG mice and other models. Based on application, the humanized liver mice model market is segmented into pharmacokinetics studies, in-vivo liver toxicity testing, drug metabolism studies, other applications. What is the revenue potential for humanized liver mice model market across regions of North America and Europe? What are major challenges influencing the growth of humanized liver mice model market? How intervention from regulatory authority is shaping the humanized liver mice model market growth? What is the average price of humanized liver mice model? Supply-demand approach has been used to estimate the humanized liver mice model market. Humanized liver mice model sale volume was first calculated for arriving the humanized liver mice model market value in different region/countries. Research activities in the top 20 countries globally were considered for the estimation of the volume of the humanized liver mice model market. Some of the other qualitative factors considered for the estimation of volume include government funding, regulatory support and other such factors. Primary research was conducted to validate the information. Primary research included interviews, surveys, in-person interactions, and viewpoints of seasoned analysts. Secondary research such as verified paid sources, authentic trade journals, and resourceful databases were also used for validating the information. Top trends as well as macro and micro economic factors were assessed to shape the humanized liver mice model market. The report on humanized liver mice model projects the industry attractiveness of all the major segments over the forecast period. Beijing Vitalstar Biotechnology Co., Ltd.